USA Today launched the Ad Meter 2016 today. 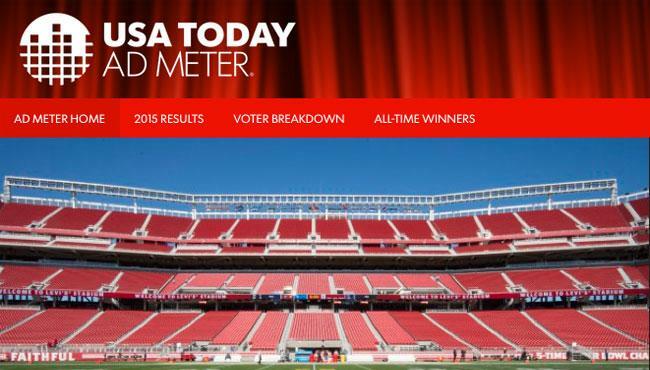 Fans of Super Bowl commercials can register to become a voter for the USA Today Ad Meter 2016 now. 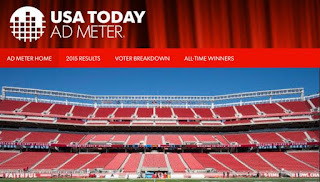 The USA Today Ad Meter, the most prestigious Super Bowl ad ranking, has overhauled the voting system and brought it into the social media era. Anybody can register as Ad Meter voter with a Facebook, Google+ or email account. The final USA Today Ad Meter Ranking for Super Bowl 50 will be available right after the Big Game. Super Bowl ads will be rated from 1 to 10 by voters. The Budweiser Super Bowl Ad starring a Puppy and the Clydesdales has won the USA Today Ad Meter Ranking last year and the year before. The Budweiser Super Bowl 2015 Ad titled Lost Dog ranked #1 an avg. vote of 8.1. There is no puppy in the Budweiser Super Bowl 50 ad, giving another brand a chance to win the USA Today Ad Meter 2016 ranking. Fans of Super Bowl ads can register here to vote for Super Bowl 50 ads once they are released.